Brig. Gen. Bruce Palmer, Jr.
To many an Allied soldier and officer and to countless armchair strategists, World War II in Europe appeared near an end when in late summer of 1944 Allied armies raced across northern France, Belgium, and Luxembourg to the very gates of Germany. That this was not, in fact, the case was a painful lesson that the months of September, October, November, and December would make clear with stark emphasis. The story of the sweep from Normandy to the German frontier has been told in the already published Breakout and Pursuit. The present volume relates the experiences of the First and Ninth U.S. Armies, the First Allied Airborne Army, and those American units which fought under British and Canadian command, on the northern flank of the battle front that stretched across the face of Europe from the Netherlands to the Mediterranean. The operations of the Third U.S. Army in the center, from mid-September through mid-December, have been recounted in The Lorraine Campaign; those of the Seventh U.S. Army on the south will be told in The Riviera to the Rhine, a volume in preparation. Unlike the grand sweep of the pursuit, the breaching of the West Wall called for the most grueling kind of fighting. 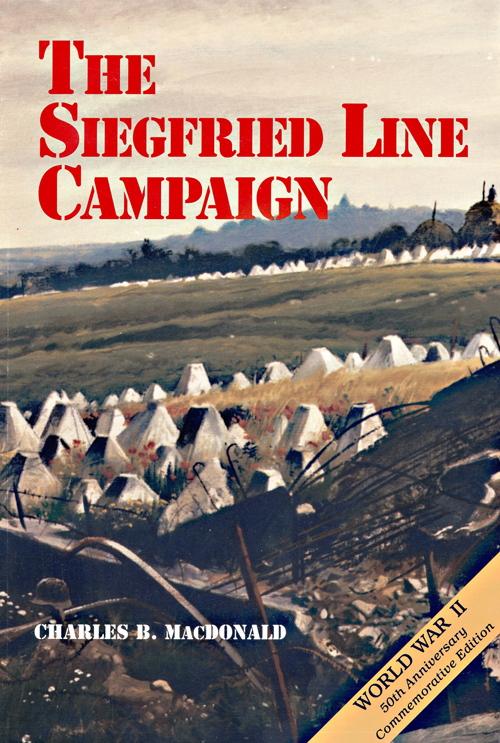 Huge armies waged the campaign described, in this book, but the individual soldier, pitting his courage and stamina against harsh elements as well as a stubborn enemy, emerges as the moving spirit of these armies In the agony of the Huertgen Forest, the frustration of MARKET-GARDEN, the savagery of the struggle for Aachen, the valor of the American soldier and his gallant comrades proved the indispensable ingredient of eventual victory. Charles B. MacDonald, a graduate of Presbyterian College, is the author of Company Commander,1 an account of his experiences as an officer of the 2d Infantry Division in the European theater during World War II. He is coauthor and compiler of Three Battles: Arnaville, Altuzzo, and Schmidt and a contributor to Command Decisions. Since 1953 he has supervised the preparation of other volumes in the European and Mediterranean theater subseries of UNITED STATES ARMY IN WORLD WAR II and is currently writing another volume in the European theater subseries. In 1957 he received a Secretary of the Army Research and Study Fellowship and spent a year studying the relationship of terrain, weapons, and tactics on European battlefields. A lieutenant colonel in the Army Reserve, he holds the Purple Heart and the Silver Star. Some who have written of World War II in Europe have dismissed the period between 11 September and 16 December 1944 with a paragraph or two. This has been their way of gaining space to tell of the whirlwind advances and more spectacular command decisions of other months. The fighting during September, October, November, and early December belonged to the small units and individual soldiers, the kind of warfare which is no less difficult and essential no matter how seldom it reaches the spectacular. It is always an enriching experience to write about the American soldier—in adversity no less than in glittering triumph. 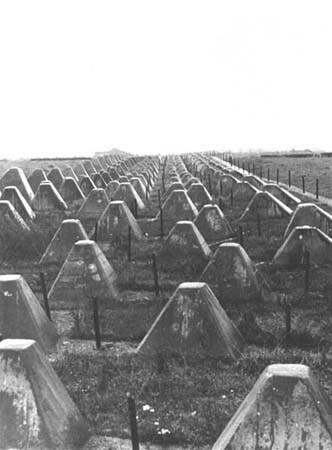 Glitter and dash were conspicuously absent in most of the Siegfried Line fighting. But whatever the period may lack in sweeping accomplishment it makes up in human drama and variety of combat actions. Here is more than fighting within a fortified line. Here is the Huertgen Forest, the Roer plain, Aachen, and the largest airborne attack of the war. The period also eventually may be regarded as one of the most instructive of the entire war in Europe. A company, battalion, or regiment fighting alone and often unaided was more the rule than the exception. In nuclear war or in so-called limited war in underdeveloped areas, of which we hear so much today, this may well be the form the fighting will assume. As befits the nature of the fighting, this volume is focused upon tactical operations at army level and below. The story of command and decision in higher headquarters is told only when it had direct bearing on the conduct of operations in those sectors under consideration. The logistics of the campaign likewise has been subordinated to the tactical narrative. It is a ground story in the sense that air operations have been included only where they had direct influence upon the ground action. It is also an American story. Although considerable attention has been paid British and Canadian operations where U.S. units were involved, this is designed only to place U.S. operations in proper perspective. In the fullest sense of the term, this volume represents a co-operative enterprise. Reference in the footnotes and the bibliographical note can give only partial credit to the scores of officers and men who furnished information or unraveled questions of fact. Nearly every officer who held the post of division commander or above during the campaign has read the manuscript of this volume, and at least one ranking officer from each division, corps, and army headquarters has read and commented upon the manuscript. The historian who performed most of the original research in German materials and by his monographs on German actions provided in effect a companion manuscript to the author's American story was Lucian Heichler. The editor was Miss Ruth Stout, who accomplished her task with high professional skill and commendable tact and understanding. Copy editing was done by Mrs. Marion P. Grimes. The maps, which serve not only to illustrate the narrative but also to tie diverse actions together, are the work of Charles V. P. von Luttichau. Miss Ruth Phillips selected the photographs. Mrs. Lois Aldridge of the World War II Records Division, National Archives and Records Service, displayed remarkable patience in assisting the author's exploration of mountains of records from the European theater. The contributions of Dr. Kent Roberts Greenfield, chief historian at the time this volume was prepared, cannot be so precisely stated, yet no individual contributed more. It was he who first brought the author into the field of military history and patiently and astutely guided his early efforts. Any credit for this volume should be divided among all those who helped make it possible. On the other hand, the author alone is responsible for interpretations made and conclusions drawn, as well as for any errors of omission or commission which may appear. What Did the Germans Know? "a remarkably beautiful late summer day"
". . . in effect we are there . . ."
Maj. Gen. Alvan C. Gillem, Jr.
Illustrations are from Department of Defense files.